Unlike Configurable Data Sources, SQL or Plugin, Power User is never given "automatic" access to the any of these Privileges when directly receiving Edit Access to an element, Category, Dimension or Event Calendar. An Admin must take an separate step to grant the required Privilege. When an existing customer upgrades to 4.0, there is a script included in the install process that automatically grants these four Privileges to existing Power Users and to the Default Group. After the 4.0 upgrade has been completed, when a new Power User is created, the user is not automatically granted these Privileges. By default, any Power User with Edit Access to a Dimension can ONLY grant View or Edit Access to the Group(s) to which the Power User belongs or to any User who is a member of those Groups. 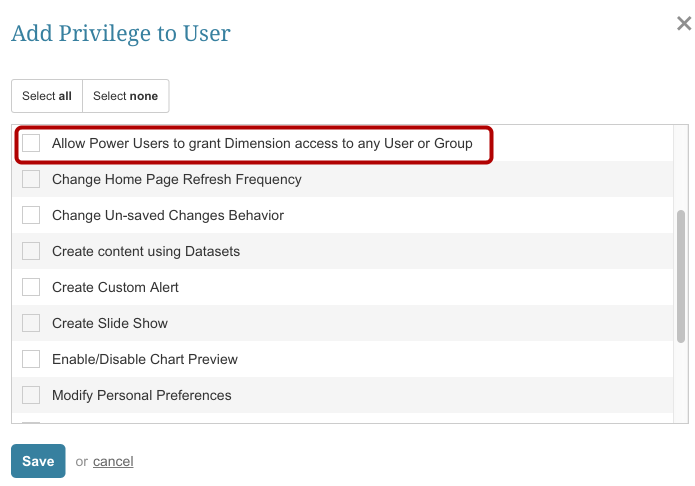 With the new Privilege, "Allow Power User to grant Dimension Access to any User or Group", the Power User is not limited when granting access to a Dimension to which the Power User has Edit Access. May still create an element dimensioned by any Dimension; however, if the Power User has no Dimension Value access to the Dimension used in the element, the Power User cannot open the element's Viewer and will receive an Access Denied error page. Must inherit or be directly granted Dimension access as well as at least one Dimension Value permission in order to open the view of a Dimensioned element that the user creats. Prior to 4.2, when the Power User accessed the Category List page, all Categories were shown in the grid. Beginning in 4.2, only those Categories to which the Power User has Edit Access are contained in the grid. Each entry has a hot link to the Category Editor. In earlier versions, Power Users with Edit Access to a Category could also grant View/Edit Permissions to the Category. In 4.2, this option ONLY visible to Admins. A Regular or Power User without access to at least one component element of a Multi-Metric or Composite Element sourced from Existing Metrics or from a Single Existing Report will see a tile on the Homepage. When clicked, a blank viewer opens. 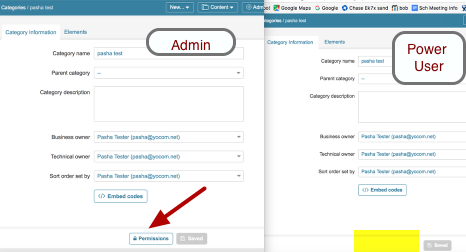 An Admin must grant at least View Access to one of the components in order for the User to see the associated Chart.